Please feel free to have a look at some samples of the high-quality information products we create for our clients (names and property descriptions have been omitted or changed to preserve confidentiality). (Some listed items are not yet online, but coming soon. We also plan to have some free information bulletins for visitors such as yourself). Tree survey plan: A survey plan begins with a recent base map of a given property. All trees of a pre-determined size are tagged, then located spatially using GPS, triangulation, or baseline measurements and, finally, plotted on a survey drawing. Tree survey plans are usually done in cooperation with a land surveyor or landscape architect, and are often produced along with tree inventory data. Tree condition assessment: A condition assessment summarizes detailed observations about a tree's health and vitality. It includes a description of the tree's physiology, a prognosis of any pathogen(s) like insects or diseases, and treatment or restoration recommendations. Trees deemed to be in poor condition often require a co-assessment of hazard potential. Tree hazard assessment: Tree hazard assessments concentrate on existing and potential structural issues that may connote a hazard to person or property. 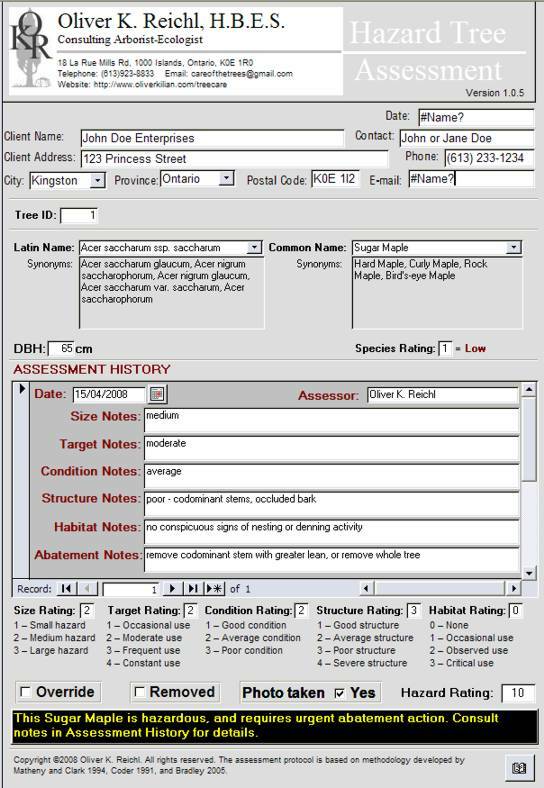 Various tree zones (root collar, trunk, crown, etc...) are checked in detail and accurately quantified as to hazard potential. Arborist Reports: An Arborist Report(AR) is required, in many jurisdictions, to obtain a tree removal permit. An AR is essentially an assessment of condition and hazard potential. However, because an AR is a regulatory construct, its scope and content must adhere to the guidelines prescribed by the local municipality's tree by-law. Typcally, AR's are only accepted from professionally-accredited arborists and foresters, not local landscape contractors or bias-prone tree care companies. Tree preservation plan: Protection and preservation plans are often required for approval of development applications, and help save trees near or within construction sites. Tree valuation/appraisal: It is well-known that trees add value to a property, but just how valuable was that 100-year old Red Oak before spray drift from next door killed it? 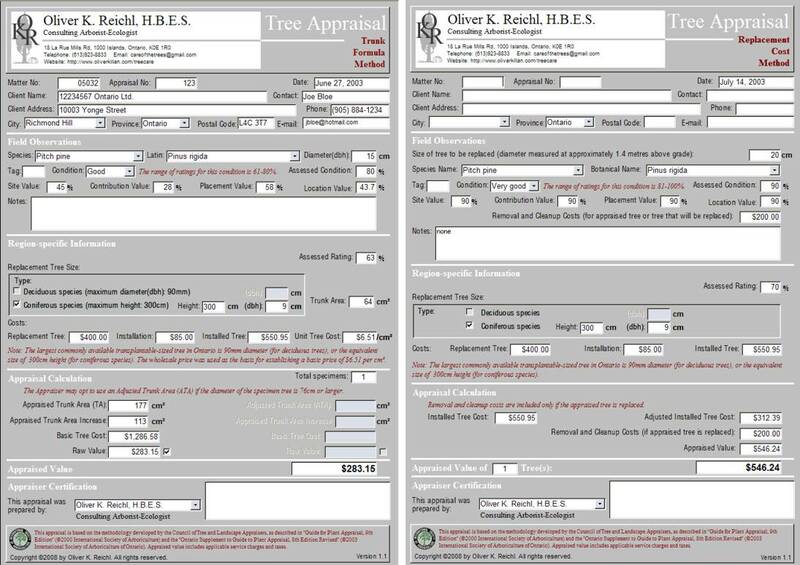 Appraisals of landscape trees follow the methodology developed by the Council of Tree and Landscape Appraisers and published by the International Society of Arboricuture.